The 95% believe wealth is earned through hard work. The 5% club understand real wealth is gained through thought. The 95% work hard and play by the rules, in a system designed to make it hard to win. Have you ever had an idea, a brief glance at your potential and then let it go thinking you could never succeed? The 95% think small. They think it’s ok to dream, as long as their dreams aren’t too ambitious. The 5% dream big outrageous dreams, and they don’t look for validation. They take action. The 95% are trapped within a shell, and it’s nothing to do with intelligence. The limitation is in their mind. The 95% share their dreams with their friends and family, and most are surprised by the negative responses of their loved ones. The story most often used to invalidate anyone who has broken free is they were lucky, or they broke the rules to do it. Anything to justify inaction. And the wealthy, they’re just greedy, immoral, corrupt. We live in a world of ever-increasing rules. Now it’s all about education. And it never ends. In 2018, gaining a degree isn’t the end of your education, it’s only the beginning. Most professions require professional re-training, but lately, it’s getting out of control. In a recent census, a third of Americans have a college degree or higher, yet 73% of Americans die with outstanding debt. Debt that averages $62,000. And it’s not just in traditionally professional jobs either. Gone are the days where you can “cold-call” an employer to work in a coffee shop. Now it’s all about the correct forms being filled in, the proper courses and certification being acquired. And of course, all this paperwork and certification cost money. Your money. The 95%’s mindset is that if things need to get better, you need to work harder. How many people do you know have gone back into education to gain another degree? Logically, it’s the right tactic. Except it rarely works. The 5% club understand it’s not about working hard, it’s about working smart, and they don’t allow anyone to undermine their dreams. Life isn’t all about money. It’s all about freedom. No one is coming to rescue you. Sorry. The 95% believe they're going to be rescued from the financial situation they find themselves in. They think outside forces will save the day. They wait for pay rises; they wait for tax breaks, they wait for government intervention. And the longer they wait, the more emotional they become. And governments are happy to deflect the blame. The giants of the economy, Amazon, Apple, Microsoft, Google, Facebook, Netflix, are all accused of “cheating” the system, and while not criminally guilty of a crime, they stand accused on an even more insidious charge. It’s the perfect weapon, used to stir up the 95% into a frenzy. The sin? Using legal mechanisms to become tax efficient while the 95% struggle to maintain their lifestyle. It’s a classic them vs. us. In 2018, the fiat money you work for is created at will based on nothing. The 5% understand if you want to play the game of life and win you’re going to have to confront risk. And they know taking risks does not guarantee success. If you’re going to speculate in cryptocurrencies, think of yourself as an early 19th-century fur trader in Missouri. The cryptocurrency markets do have the potential to change your life, but they are the wild-west of financial instruments. Nothing is guaranteed, and you’re not entitled to anything. One of the most common regrets at the end of life is how little risk was taken. It’s a paradox. The safer they made their life, the more unsafe they became. And if you’re going to venture into the wild, it helps to understand what you’re up against. The 95% go out unprepared, dressed in a dinner jacket in the forests of Missouri. It does not bode well. The 5% club come properly dressed and ready for action. They don’t just turn up with a flintlock musket and a knife. They go into the forest with heat-seeking missiles. The 95% curve fit the data to get the best results. A 30-period average works well, but then it fails, so they use another. And they add multiple indicators to reinforce their bias. The 95% concentrate on their entry and focus on how much they’ll make. In contrast, the 5% club focuses on their risk, and how much they’ll lose if their idea doesn’t work. Even worse, the 95% get their ideas from someone else’s recommendation, or they use a system they’ve purchased or found online. The 95% rarely think about the quality of the information the system they’re using is feeding back to them. For example, the 95% are oblivious to the pitfalls of using moving averages. They don’t understand what a moving average is measuring, and they don’t know how to interpret what it’s telling them. If you doubt this ask yourself (or anyone who uses them), how a moving average works and what information is it telling you? The answer you’ll most likely get back will be something like, “It’s an average of the last n prices.” Yes, but how and why does a moving average give you market feedback? A moving average removes all the price cycles less than the moving average length. If you plot a 20 day moving average on a chart, you're eliminating all periods of less than 20 days in length, and leaving all cycles of 20 days and longer as a proxy for the trend. But to use it correctly, the moving average needs to be displaced back in time by half of its length. A 20-day simple moving average is displaced ten days back in time. The 95% use moving averages as proxies for trends. The 5% club use moving averages as proxies for trends too, but they also know how to use them to assign a likelihood to a price move. What a moving average does is remove all the cycles less than the length of the average, in this case, 20 days. What you’re looking at when you see a displaced average of 20 days is the effect on the price of all the cycles greater than 20 days. 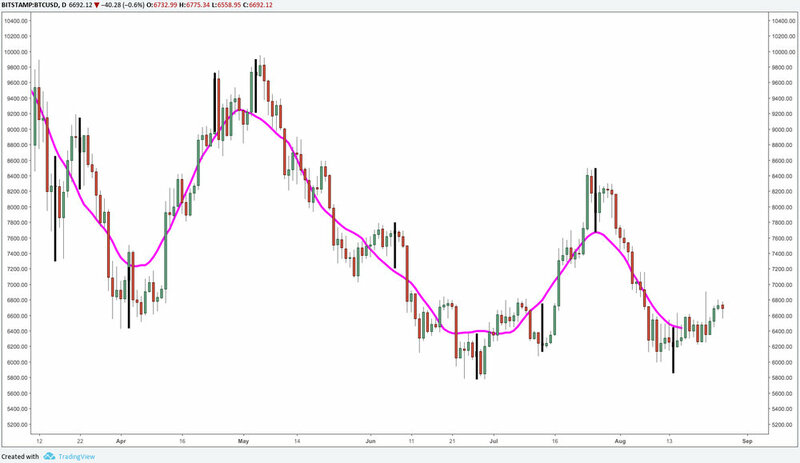 The pink line is a 20-day simple moving average displaced by half of its length or 10 days. It’s easy to see how the price oscillates around the displaced average. The price will remain within certain limits as it oscillates above and below the displaced average line, and it’s possible using simple math to assign these excursions to a probability. The pink centred line represents all the cycles greater than 20 days. The moves away from the line can be averaged, and this figure represents the price movement influenced by all periods less than or equal to 20 days. The chart above has hand-drawn black lines representing the excursions from the displaced, centred average, but this can be done programmatically. If you collect all the values and average them, you have created a distribution. And a distribution can be analysed. From the distribution of excursions, you can calculate the mean and standard deviation, and once you know what these values are you can assign a probability of a low or a high being in place. A simple no-math way to think about it is to take the one and two standard deviations of the excursions and use them as a plus or minus figure from the current price. All the price movement within the plus or minus two standard deviation channels are the result of cycles of 20 days or less. If you see a move outside of the upper two standard deviation channel, it’s direct market feedback a cycle low greater than 20 days is in place, because statistically, only 5% of price excursions are greater than two standard deviations. There’s one more step to take. The data is generated using moving averages displaced by half of their length, but you don’t know where the moving average is at the hard right edge of the chart. The quick way to find out is to extrapolate the average into the present using two points on the displaced average and extend the line into the future. The 95% are up against this kind of analysis when they journey outside into the wild-west of the cryptocurrency markets. The 5% club don't guess. If this sounds like a lot of work, the 5% club have taken it a stage further and automated it. Systems based on mean reversion, trend changes, and volatility are being run every day on all major financial instruments. The 95% rarely figure out their own systems. But be sure the 5% club do. Turning up to a gunfight with a knife in your hand is not a good idea,(unless you’re Britt from the Magnificent 7) but the 95% do just this when they jump into a market with little planning, dreams of avarice in their heads. Being aware of what you’re up against is half the battle. The other half is mastering your emotions as discussed in the Thinking in Threes series. Begin your journey towards 5% club membership by flipping your mental focus away from profits and towards risk. The 5% club know that success comes from consistency. It’s not about winning. It’s about discovering an edge, and executing the opportunities the edge delivers perfectly. Rinse and repeat. The 5% club use a collection of edges. A 5% club strategy does not just rely on one tactic. More often they use a group of tactics. They explore edges in non-correlated markets and use feedback from markets as signals to use one strategy over another. Some automate the entire process. Others act using discretional judgements based on their ideas. Trusting the idea is vital because no edge lasts forever and no system always wins. 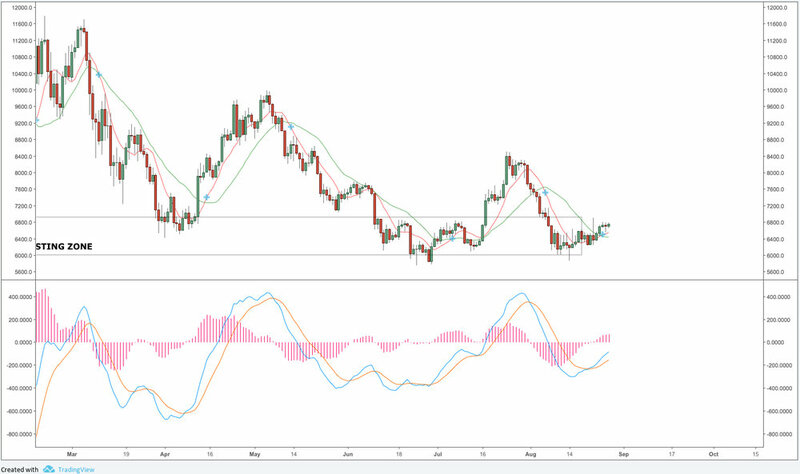 The cryptocurrency markets are highly positively correlated, and because of this, spreading your risk around many coins, will not provide an inbuilt level of protection to your outstanding risk. When one goes down, they all go down, and vice versa. When you have all your risk focused in many highly correlated markets, you’re exposed to system failure (going broke) because if bad news hits it will affect all your positions negatively. 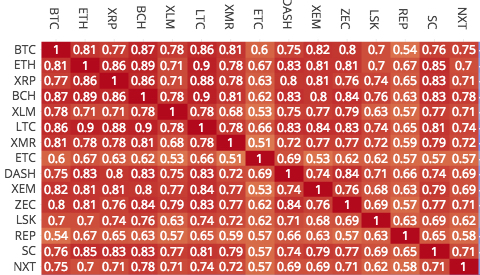 Here’s the current cryptocurrency ninety-day correlation matrix. Any value of + 0.6 or higher and - 0.6 or less is considered a strong correlation. And as you can see most coins in this matrix are at - 0.6 or lower. 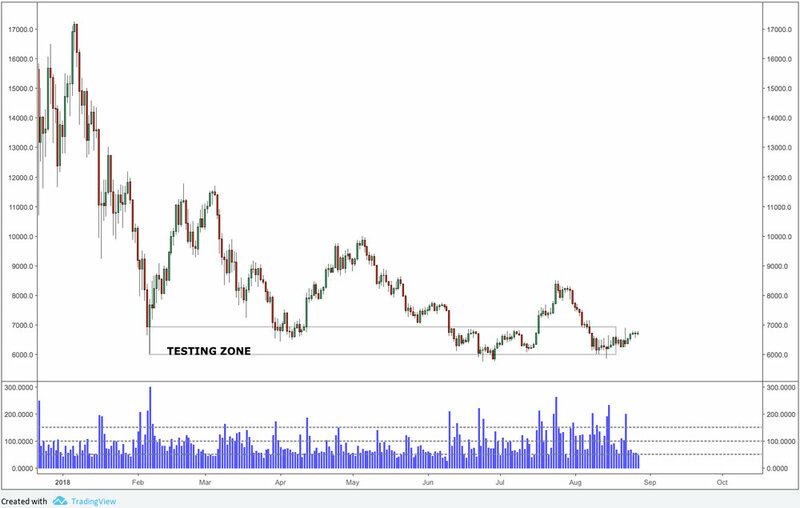 Remember, the cryptocurrency market is highly positively correlated, and coins tend to move up or down together, and that’s why it’s useful to keep track of what Bitcoin is doing. Because Bitcoin currently represents 53% of the entire crypto universe by market capitalisation, and because Bitcoin is still the leader regarding volume. By far. 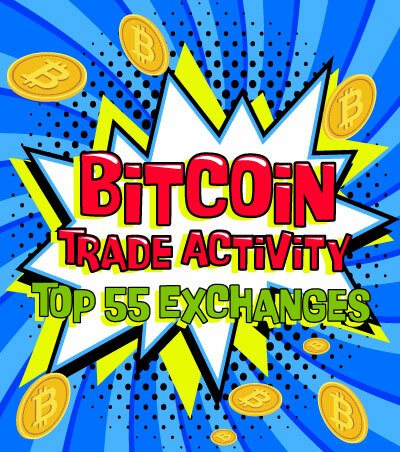 So until there is decoupling between Bitcoin and the rest of the cryptocurrency market, watching Bitcoin is the quick and simple way to keep track on the entire crypto space. Turning up unprepared is not a good idea unless you want to part of the 95% who lose. Success comes with first finding and then testing the expectancy of an edge, and success comes with exploiting the edge perfectly and unemotionally. The question is, how do you find an edge? Imagine a country called Arcadia. You’re given the names of two Arcadian cities, and you recognise both. Because you recognise both cities, you know neither is the national capital of Arcadia. On a quiz show, you’re asked which of these two cities has the largest population. To solve the problem, you can ask the gameshow host three questions not related to the population of either city. Which cities have a major league soccer team? Which cities have hosted major exhibitions? Is either city on an intercity train line? In a study, using cities in Germany, question one gave the correct answer 87% of the time. Question two was correct 91% of the time, and question three was correct 78% of the time. Coming up with accurate guesstimates does not need to be complicated. A simple heuristic can be more powerful than complex studies. In 2009, Alice Schroeder’s book on Warren Buffett — “The Snowball” was an international number one bestseller. Buffett, then the world’s wealthiest man, gave Schroeder exclusive access to his inner world. The book is the result of her spending 2,000 hours at his side. On Schroeder’s first visit to Buffett’s office, she expected to find complex computer systems. She expected a hive of activity. What she saw shocked her. Buffett is famous for speaking in a simple homespun language. His mantra is it does not need to be complicated. A few simple principles are all you need. Contrast this to multi-billion dollar analysis industry that Wall Street investment banks use to crunch the numbers. Buffett doesn’t do any of it. The major takeaway from the book is a glimpse of the process Buffett uses before he takes action. His number one question — always - is, “What are the odds of this investment being exposed to a catastrophic risk?” If he judges the risk is too high, that’s it. The decision is made. No investment. But if the investment passes the risk test, Buffett moves on to the analysis. Does Buffett use Wall Street investment bank analysis techniques like discounting the cash flow? No. Not according to Schroeder. Instead, he asks simple questions of the market he’s looking to invest in. Buffett was approached to invest in a business. Instead of an army of Harvard graduates, working seventy hours a week for Wall Street investment banks, slicing and dicing the data, discounting the cash flow, and building risk models, Buffet asked a few simple questions. Next, he asked, “What is the net profit every time the company turned over its capital once?” In other words, Buffett is asking how much profit will be made every time the company sales is equal to the amount invested in the business. Buffett, using simple math and asking three questions, (Thinking in Threes) knew that if the company was turning over capital seven times, then seven times the net profit of $11,000 was $77,000. Buffett realised he could get his investment to risk-free, or his money back in around one year. Have you ever watched Shark Tank, or in the UK — Dragon’s Den? That’s what these shows are about. How millionaire investors get a great return, balanced against their risk. And getting their seed investment money back as soon as possible. Next, Buffet asked for the net profit margin of the product. Buffet thinks about scalability. The sales data was growing quarter by quarter at 70% per year on a million in sales, with a net profit margin of 40%. Buffet always guesstimates a margin of safety. What are the odds of doubling the sales and maintaining the net profit margin above 15%? Given the current profit margin of 40%, that’s a wide margin of error. He was in. Buffett made this decision asking three questions and checking a fourth — the profit margin. If the world’s most successful speculator embraces simplicity over complexity, perhaps there might be something to it. Edges are everywhere. Some are long-term and last years, and others are short-term and last days. Some last only for a few seconds. It’s useful to be competent at math and computer programming if you want to uncover short-term edges, but the best edges, the ones that tend to last for years, are often found using no coding or math skills. You find them using inference and Warren Buffett’s process of asking simple questions. In Games without Frontiers, we used a Trilemma as a thought experiment. Think of an equilateral triangle. At each point of the triangle, there’s a choice. You can pick any two, but not all three. Think about how the world works today. It’s a web of global supply chains, and this web of supply is an arterial system that feeds the world and keeps the peace. Let’s call it globalism and put it on the top of the triangle. Next, think about, the freedom the West enjoys, and compare that to others who did not win the citizenship lottery. Democracy has provided citizens of the West with safety, education, healthcare, and the ability to acquire wealth. It’s taken as a given, so let’s put Democracy on the bottom left point of the triangle. Since the Arab Spring in 2011, we’ve seen the greatest upheaval, in terms of refugees, since WWII. Understandably, they head for Europe. They head for Australia, anywhere to escape the atrocities. As a result, we’ve seen a dramatic shift towards populism and a move to the right in western politics. This resurgence of populism has another name. Nationalism. So let’s place Nationalism on the bottom right point of the Trilemma. In a Trilemma, you can’t have all three. You can pick any two. Let’s say you estimate globalism has to stay. It has to be selected because if the system collapsed you wouldn’t need to worry about having enough money. The money would be the least of your problems. The currency of the day, wouldn’t be the dollar, euro, pound or yen. It would be the club. Think of globalism as a super-tanker at sea. Even if you throw the engine into reverse, momentum is going to keep you travelling forward for some time. If nationalism is the second choice, chosen from the evidence of what is happening, then this, unfortunately, means that democracy will be in decline, for the next epoch. If this scenario is true, and nations isolate themselves from each other, then what commodities, systems, and countries will benefit? If any? And what will be used to keep the arteries of the world’s interconnected supply chains clear? In this environment of distrust, do you think this sets up blockchains as a mechanism to enable world trade in a time of increased xenophobia? If so you’ve just uncovered a potential edge. No math required. And if you invest with this economic backdrop as your primary reason, your timescale could be anything from five years to decades. This is how real wealth is made. It’s buying Microsoft in March 1986, after looking at Windows version 1.0 — an investment where 100 shares at $21 a share would be worth over a million today. It’s buying property in the UK in 1994 when developers couldn’t give it away. It’s buying real estate in Australia — before the mining boom. It’s buying Yahoo in 1996, before the internet boom. It’s buying Gold in 2001, just after the British government sold its gold reserves at near record low prices, in an event known in the city as the Brown bottom. Will you be looking back in twenty years time, and saying, “If only.” The 5% club, think it through. They make decisions and invest accordingly. It doesn’t mean betting the farm. It means investing in something that will pay off in the future — if the edge you’ve uncovered is correct. If the 5% club is wrong, the outcome doesn’t affect their ability to take a new position in the future because they managed their risk. What if you’re not interested in long-term speculation? What if you want to trade and speculate over much shorter time frames? The 5% club use tools that give them feedback on the state of the market. Just like Warren Buffett asking simple questions, the 5% ask simple questions too. They use Plus-One day emotion bars and relative volume turnover. They use relative strength, implied volatility, and moving averages to assign probabilities to price movement. In contrast, the 95% use technical analysis as taught to the masses. They use indicators based on lagged averages that don’t give timely information about the current state of the market. 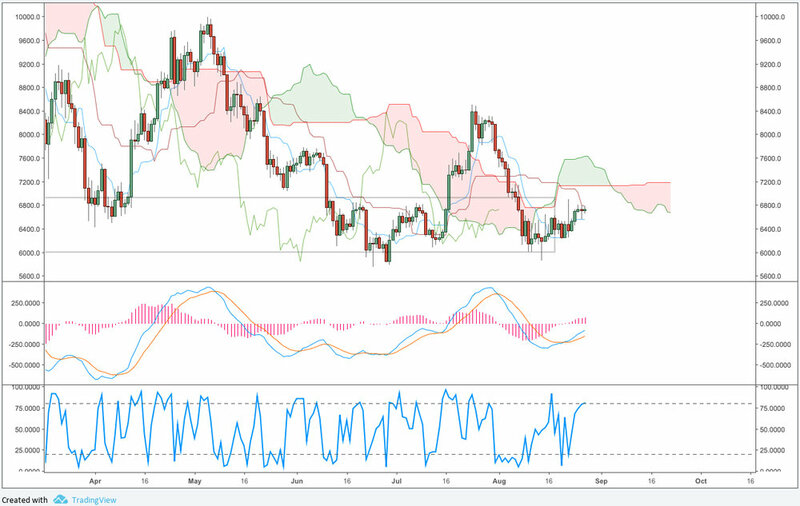 The indicators used by the 95% are just proxies for trends and price momentum. The 5% club turn up properly dressed and ready for action. Remember our 19th fur trader? The 95% go out into the wilds of the cryptocurrency markets with the wrong shoes and no gun. The 5% club turn up in full survival gear armed with heat-seeking missiles. The 5% analyse the market’s behaviour. The 95% analyse a market using something like this. The 5% club use something like this. The 5% club asks the right questions. Questions that give up to the minute feedback on the behavioural state of the market and entry trigger points. They use tools that give them binary feedback. Binary feedback is information that’s just as important in calculating the likelihood of the next sequence of moves, regardless of the outcome of the current trade. The 5% club are creative. They use multiple sources of data, not just price, and volume, to extract edges, and they know that behavioural science in financial markets is capable of exposing edges too. Here’s an example of the 5% club’s process. 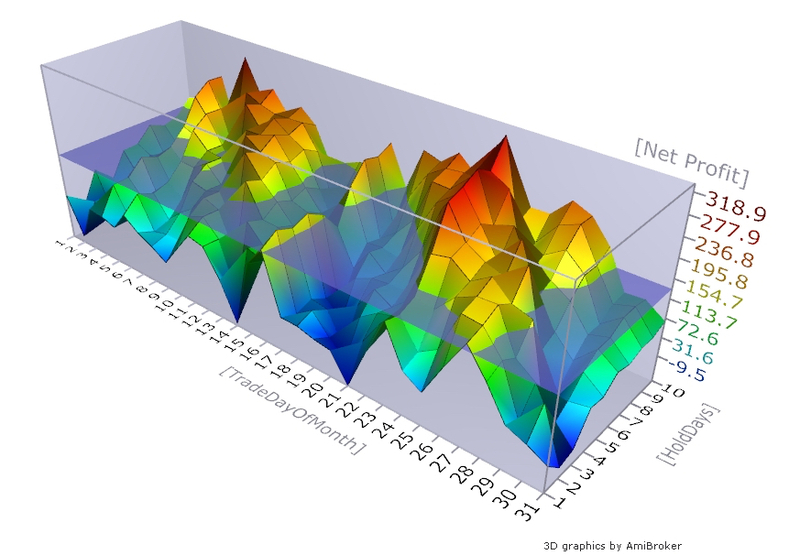 Using the surface graph (image above), you’ve identified two days a month where performance is consistent. The 14th is consistently poor and the 20th consistently good. What if you bought on the open of the 14th and sold on the close the same day? What if you bought on the open of the 20th and sold on the close the same day? The 5% club look for two things. A consistent trend in the equity curve of past results. This is the equity curve since 2010 of buying the open on the 20th trading day of the month. Because the performance of the 14th is so consistently bad, the 5% club go short on that day, betting the market will fall. (Going short means selling the Open and buying the Close) The results, as you can see, are negative, which means the short positions are positive. The win/loss ratio is 1.4133, and the percentage win is 51.4%. From this data, the 5% club can calculate their expectancy. In this case, they expect to make 24 cents profit for every dollar they risk. Is this a good enough system? Expectancy is only a rough measure, and just like Warren Buffett who advocates a margin of safety with his investing, the margin of safety will need to be checked even though 24 cents profit or 24% return looks good. The 5% club don’t guess. They check. Just like Warren Buffett would do. The 5% club ask, “If I did this trade thousands of times what can I expect the results to look like?” Remember expectancy is just the average of all your returns. The 5% club look for the outliers. The black line is the 24 cent expectancy calculated from the formula. What you’re looking at is the result of doing this trade one million times. 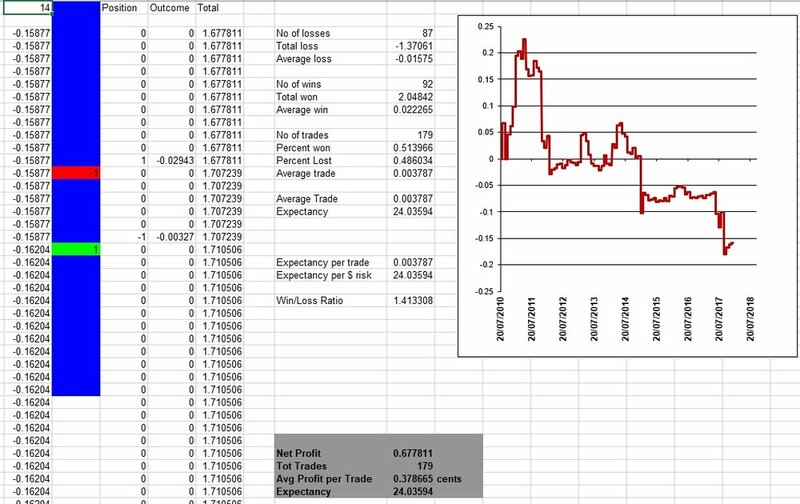 Each data point is the net result of taking the trade one thousand times and repeating one thousand times. The 24 cent figure is the average return. Some returns are much less. 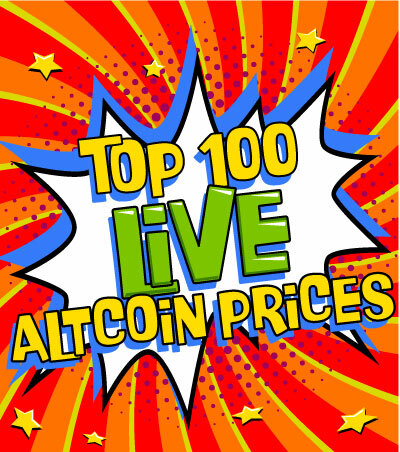 On these excursions, you’ll experience sequences of losing trades, drawdowns, and losses. And this is where the 95% quit. They don’t understand what the system they’re using (if any) is capable of doing, and after a few losses in a row, they quit and go in search of another system. The 5% understand the behaviour of the systems they trade, and they control their risk. You may be thinking that this kind of data is impossible for you to calculate as a retail investor, but you’d be surprised. All the data generated here used three software programs. Total cost less than $500. Just like Warren Buffett, the key is asking the right questions and trusting what comes back. If you’re going to speculate in the wild-west cryptocurrency markets, it pays to know what you’re up against. The 5% club use strategies to discover edges and use heat-seeking missiles, once the target is acquired. The 95% take tips and turn up without any boots.